With all the complex technologies that help make flat panel monitors and flat-screen televisions, well, flat, it's no surprise there's some confusion about exactly what's happening behind our favorite screens. If you're in the market for a new TV or monitor, it's helpful to know what all the acronyms and spec-speak actually means for your viewing and using experience. Maybe you already appreciate the price differences between LED Full Array and LED Direct Lit TVs, but once you know how these configurations really work, you'll really start seeing their value in a completely different light. Tips: How do you know what type of panel is in your screen? Easy - just check the product page on the manufacturer's website or any instructional information that came with it. There's a lot of confusion and misconceptions about the science of panels, so this display explainer aims to give a basic breakdown of the types of displays available today. It's our hope that by the end of our two-page primer you'll be officially certified to school friends and family in screen tech 101. Plus, when it's time to go shopping for a new TV or monitor, you'll be fully informed as to what you're buying. One last note on resolution before we get started: All the panels listed - with the exception of plasma - can produce a 4K picture, but nowadays most screens typically come at resolutions of 1920 x 1080, though it's not a hard and fast rule. Now that we have that cleared up, let's start with the basics: LCDs. It's no surprise that one of the oldest flat-panel technologies is also the one with the most variant off-shoots. But to understand liquid crystal displays (LCD) you have to first wrap your head around the concept of light polarization. Polarizing light works like a filter to block and isolate specific light waves. This is why polarized sunglasses are popular, since they block out sunlight through super tiny slits that essentially stops light in its tracks. 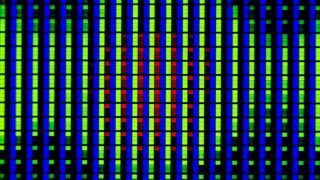 LCD polarization. See how polarizers change the orientation of light? In simple terms, light waves travel vertically and horizontally, and polarized glass uses the slits to block out one of these waves at any given time. When that specific light wave passes through the glass, it can only pass through polarized glass if it is in the same orientation (horizontal or vertical) as the glass. Layers within LCD displays are oriented to let in one of these types of light waves. There are several kinds of LCD displays found in today's TVs and monitors. The distinction is often not spelled out clearly on a spec sheet, but knowing what kind of display you're shopping for can make for smarter purchasing decisions. TN - Stands for Twisted Nematic, which is one of the most common types of LCDs. Its application in consumer devices use dates back to the late 1960s and traditional TN displays can still be found today in calculators, alarm clocks and budget media players. In other words, most consumer electronics you can find in a drug store. LCD is comprised of a material known as nematic liquid crystal, which is the substance that's placed between plates of polarized glass. It gets its name from the liquid crystal's reaction to an electric field. The absence of such a field twists the cell 90 degrees. Conversely, the presence of an electric field (after voltage is applied to the electrodes) forces the liquid crystal molecules to align with the field. In layman's terms that means the presence of electrical current allows light to pass through, while the lack of current means the pixel stays dark. How you can explain it to mom: Light travels one of two ways: horizontally and vertically. TN technology works as a kind of "light dam" that controls when light does and does not pass, and whether you have a lit pixel or a pixel devoid of light on your screen. Twisted nematic literally twists its light filter horizontally or vertically to block light or to let it go through. Devices you find it in: Digital watches, calculators, car instrument panel displays, first-generation flat-panel computer monitors as well as various monitors today. VA - Stands for Vertical Alignment. It's often considered the middle child of the group between TN panels and IPS displays. Like Twisted Nematic panels, Vertical Alignment panels use liquid crystals and electrical current to tilt polarized glass but have a slightly altered manufacturing process. The result is a deeper black background, better image quality, and a higher contrast ratio over traditional twisted nematic displays. As a group, vertically aligned liquid crystal molecules are more organized than TN molecules, which are neither fully vertical nor horizontal. This results in better control of light and less light leakage in VA displays. If you like great viewing angles and dark blacks, and don't mind average response time, VA monitors are fine options. How you can explain it to mom: VA monitors are better than TN panels, but still not the best LCD screen you can get. Devices you find it in: Computer monitors. You'll find them next to IPS and TN displays at the electronic store. IPS panel vs TN panel. IPS is on the left. Source: Reddit. IPS - Short for In-Plane Switching, IPS was primarily designed to solve TN's limitations, including limited viewing angles and color reproduction. Whereas TN liquid crystals slide around the panels of glass, IPS liquid crystals are kept in place using an electrical field. To generate this field, IPS panels need twice as much electricity to power the increased number of transistors. As a result, IPS displays consume more power than TN displays. Like Vertical Alignment, In-Plane Switching controls liquid crystal molecules better than Twisted Nematic. To be "in-plane" also means to be parallel with the glass outer layers, which leads to more focused light. How you can explain it to mom: IPS panels have the best color reproduction of any standard LCD display. The contrast isn't as good as LCD LED displays, but IPS panels are usually cheaper. Devices you find it in: Computer monitors, competing with VA and TN displays. PLS - Plane-to-Line Switching technically falls under the IPS classification. The only notable difference is that PLS is manufactured exclusively by Samsung, which claims that PLS is more cost-efficient to produce than IPS. With similar response times and contrast ratios, PLS is generally considered similar in nature to IPS, just manufactured by one company. That's not to say it's only found in Samsung monitors, though. Samsung makes PLS panels for other device manufacturers like Dell, AOC and even Philips. How you can explain it to mom: PLS is a tweaked version of IPS branded by Samsung. Devices you find it in: Primarily Samsung computer monitors, although Dell, AOC, and Philips buy PLS panels from Samsung for their screens as well.